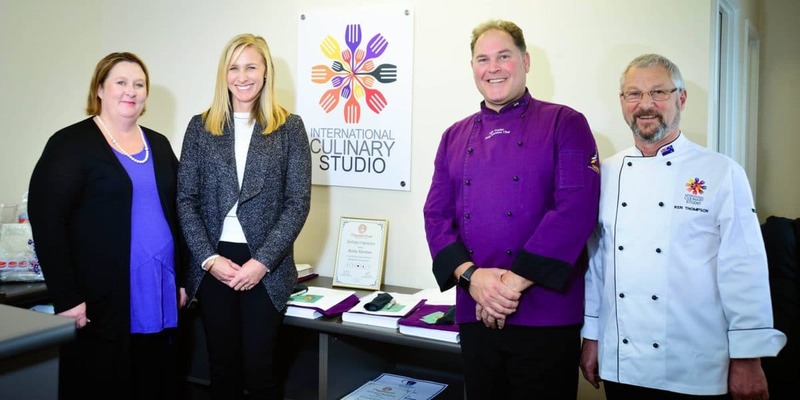 The International Culinary Studio Academic Board provides academic leadership, acts with integrity and professionalism, upholds the highest ethical and academic standards, promotes diversity in the interests of fairness and of good governance, and is committed to transparency, accountability and responsible stewardship of the Companies reputation! Cheryl is our Director of Studies at International Culinary Studio. Her life story is the stuff of legends and not only is she a Culinary Guru in her own right, she is an award-winning Business Woman and our dynamic leader at ICS. Cheryl grew up in rural sugar cane country in KwaZulu Natal, and as a child already fluent in English, Zulu and German, she had big dreams of becoming a teacher. But life had other plans for her…. As fate would have it, a brand new hotel went up in their town and Cheryl started working there as a teenager. And almost immediately, her love for the hospitality was born. After qualifying as a Hotel Manager at the age of 21, she started her own highly successful Catering and Events company which she sold at 28 years old. For the next few years, Cheryl worked at a number of different colleges in various roles and gained an enormous amount of experience in the business of education. In 2003 Cheryl opened a hugely successful Chef College in South Africa. Staring out with just 4 students enrolling in it’s first year, it was sold to a listed company 13 years later with over 1000 annual enrolments and 6 campuses country wide. What started out as an industry first is now a globally respected educational institution, with an abundance of Culinary success stories coming from their college kitchens. Cheryl relocated to New Zealand in 2013 with her family, and after extensive research and planning, the International Culinary Studio was born. A cutting edge educational facility – another industry first – that offers online culinary qualifications and accreditations for everyone from Home School students to Industry Professionals around the world. A true labour of love from her two biggest passions – Education and All things Culinary. Out of the office Cheryl is Mom to Erin and Niall and furbaby Toffee. Most likely to be seen transforming an everyday event into an extraordinary, high tea culinary extravaganza, while the rest of us rocked up with packets of biscuits and paper napkins. And planning what she will plant next in her kitchen garden. Andy is our Group Executive Chef at International Culinary Studio.His phenomenal journey as an Executive Chef, Master Chef Judge, Personal International Diplomat Chef, Caterer to Nelson Mandela and even a role running a massive Casino Culinary operation – all from humble beginnings as a 15 year old waiter in a family restaurant, are the stuff dreams are made of and are a testament to the endless possibilities available to qualified Culinary professionals. Andy grew up in a home surrounded by food and friends, with a Mother who was a very keen cook and their home was a hive of activity. Social gatherings and delicious food was perpetually in abundance, but some of the most evocative memories that started Andy on his Culinary journey, came from their Italian family friends. The Italian tradition of filling the kitchen with absolutely everyone, while preparing meals with love and the freshest of ingredients and always eating together, ignited Andy’s fascination with food. And although he didn’t know it yet, his journey as a Chef had already begun. Working as a waiter in a family restaurant at 15, also afforded him the opportunity to be trained in all aspects of the kitchen. And he learnt about everything from cold kitchen culinary to the butchery, desserts and the grill. Just two years later Andy started his military service and because of his background in the kitchen was immediately put in charge of the catering division. At 17 he was managing a team of Chefs and running the entire Food and Beverage operation on the border during the Angolan War. When the completed his service at 19, with a level of experience that many will never have had in their lifetime, Andy entered the Hospitality Industry through a large hotel chain and completed his 3 year apprenticeship programme in Professional Cookery in just two years. It comes as no surprise that he was named Trainee of the Year in both of those years. The next culinary adventure was just around the corner and Andy joined a Corporate Catering Company in South Africa as Group Executive Chef. The catering company that also happened to be the preferred service provider for Nelson Mandela. And he catered for some of the most pinnacle moments in history – Nelson Mandela’s release from prison, his birthday bash that followed and then sadly, also his Presidential Funeral a few years later on. A Casino moment came next with Andy running a massive Casino operation with a 5 Star Hotel. He managed 186 Chefs and 6 Executive Sous Chefs in his team. And went on to open a restaurant chain as well as a role as Commercial Manager for a large fruit and jam International Brand, where he got a chance to gain experience from the other side of the kitchen. And gained valuable food design, product development, marketing and business skills. His accolades and experience include starting a high-end Catering and Events company which ran large functions of up to 500 people per seating, with multiple events on the same day. As well as managing and operating one of the world’s biggest cycling events, International Cricket Events as well as being the Culinary Service provider for the Opening of Parliament in South Africa. During Andy’s career, he has also represented South Africa as a Chef on the National Team, was a Master Chef judge and headed up a National Sausage Making Competition. His reputation as a sought- after judge in many Culinary Skills events continues to keep in high demand today. “Living in New Zealand, and especially Christchurch, with the rebuild, is a wonderful experience, and I am very excited to be involved since the inception of International Culinary Studio. Out of the office Andy is an avid Mountain Bike enthusiast, Super Hero Dad to 4 children and slave to Toffee, his gorgeous dog. Most likely to be seen: Whipping up Michelin Star worthy snacks in the ICS kitchen. David is the Academic and Development Manager at International Culinary Studio. A born a bred North Cantabrian, from a local farming family and whom still lives and works in Canterbury. A Rangiora High graduate at 15 years of age, David started his career with a collection of various jobs before heading to the University of Canterbury as a mature student and graduating with a Ph.D., majoring in Sociology. His extensive career has seen him in the PTE sector for over 15 years, in roles including Business Tutor, Academic Manager and Director of Studies. His work so far has taken him into exciting sectors such as Travel and Tourism, Hospitality, IT and Business Management at Diploma Level. David has a keen interest in online education, already experiencing the concept in the sector as exciting and positive, before coming on board to International Culinary Studio. As a Father to 4 adult children, David has seen first-hand how quickly the education sector is transforming and continues to grow in leaps and bounds in the online field. Out of the office David and his wife Saori, who is originally from Japan, are keen outdoor enthusiasts and love travelling and exploring New Zealand. On weekends you will find them enjoying forest walks and visiting local cafes, always on the hunt for a new menu and the best coffee in NZ. David and Saori are also pet-parents to dogs Milo and Mocha and cat Latte. Bookworm David is also a keen connoisseur of good reads. With a particular love for both fiction and non-fiction, Victorian murder mysteries and trials. Joanna is our fabulous, friendly Student Administrator and the first smiling face you see when you come through the front door at our office. And along with the rest of the team, ensures that all of ours students have a positivie and efficient experience. She loves working with such a diverse range of people and as a Mom of 3 almost grown children, has a dedicated passion in helping our students achieve their goals. Joanna is a health and fitness guru and has been spotted on the streets of Kaiapoi during lunch time getting her walk on and racing somewhere on her bicycle on the weekends. Cheryl is our Customer Relationship Manager at International Culinary Studio. Hailing from Waikuku and with a rugby mad husband and two school age boys, she was always going to be an avid Canterbury Crusaders supporter. After years working in the electricity industry with roles in sales, marketing, energy advisory, project manager and key account manager she was snapped up by Image Label Systems where she was the area manager for the lower North Island and South Island. After a complete change of direction with the birth of her sons, Cheryl went on to do a diploma in Creative Writing, enjoyed a stint as a consultant for a well-known lingerie brand, and catering for her local rugby club Ohoka. An avid bookworm, she devours books back to back each week, while still finding the time to walk, bike, play for multiple touch rugby teams ( in summer) and squeezing in some Pilates and good old Wine O’clock in between. Cheryl loves to travel and is always either planning or eagerly awaiting the next destination. Ken Thompson has been a Chef for the past 43 years. He brings a wealth of experience that our students will most certainly benefit from. Worked in a Michelin Star Restaurant in London, UK. Has worked as a chef globally across Europe, The Middle East, Australia and New Zealand. A Level 6 Competition Judge. Taught for over 17 years in colleges across the countries. Coached many winning student competition teams. Won Gold, Silver and Bronze Medals at a number of competitions globally himself. Catered in a team of chefs for a function for Princess Anne. Life Member of the New Zealand Chefs Association. Ken has a passion for the youth entering into the culinary world and has made an impact on so many culinary professionals’ lives. We are excited for him to join us and to share the amazing culinary knowledge he has. Tracy is our Design and Digital Marketing Manager at International Culinary Studio. A self-confessed analytics junkie with a background in e-commerce, retail and hairdressing! After 20 years Behind the Chair with her own thriving Hair Salon, it took a move from the city to the country for Tracy to discover she was ready for something else. At the encouragement of her husband and after an interesting stint as a freelance copywriter. She opened her own online store, closely followed by a second one and plunged completely into the deep end of the exciting and dynamic world of e-commerce. But just 5 years later change was on the cards again, when her husband was offered a once in a life time role in New Zealand. Her online store, Legwear Safari, was bought by one of her customers and the family packed up and headed to the sunny South Island for an exciting new start. Tracy brings a creative and entrepreneurial approach to the International Culinary Studio Marketing Team with an unconventional outlook and strategies – one who has never been afraid to push the boundaries. Out of the office Tracy is the Deputy Head Wrangler to a pair of teenage daughters, Head Tucker-Inner of 3 spoilt rescue animals, and a passionate animal activist who will happily crochet for tattoos. Most likely to be seen: Having a second helping of Chef Andy ‘s cheesecake and trying to convince her husband that they have space for a Llama.